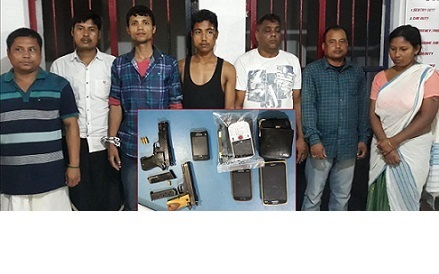 A special investigating team of Tinsukia Police on Sunday morning arrested seven people on charges of being allegedly involved in the Rupai shoot-out incident in which a grocery employee and a customer at Rupai-Siding market in Doomdooma on May 18 evening last. Acting swiftly to the assigned mission, the team under the leadership of Assistant Superintendent of Police (ASP) and Deputy ASP (HQ), Tinsukia launched an operation and successfully nabbed seven people for being allegedly involved in the incident. The arrested people have been identified as 21-year-old Montu Moran, son of Pradip Moran of Jokaichuk under Baghjan PS, Rupantor Moran (25), son of Juneswar Moran of Jokaichuk area of Baghjan, Niranta Baruah (36), son of Someswar Baruah of Kordoiguri village of Baghjan area and Ramesh Mahanta (38), son of Kamal Ch Mahanta of No 1 Kakopathar area under Kakopather PS. The others who were also arrested by police are Bijoy Verma (41), son of late Prabhu Dayal Verma of Talap area under Doomdoma PS, Khitish Baruah (36), son of late Thaneswar Baruah of Dayel Gaon under Chapakhowa PS along with female accomplice Dipali Saikia (32), wife of Bipul Saikia of Sadiya 5 Mile under Chapakhowa PS. Meanwhile, all the accused, involved directly or indirectly in the act of killing Jit Verma and customer Ramakanta Deori, were booked. Two pistols along with five rounds of ammunition and cell phones have been seized. All the accused involved directly or indirectly were booked in reference to case No 127/18 U/S 448/397/302/34IPC R/W SEC 25(1)(A)/27ARMS ACT of Doomdoma Pilice Station. When asked, MugdhaJyoti Mahanta, the Superintendent of Police, Tinsukia denying direct involvement of any militant organisation in the act, however, said that some of the accused might have been serving as ULFA linkmen but the incident was pre-planned and it was designed primarily to extract money from the business establishments. “Keeping CCTV surveillance active all the round and working in close coordination with the local police might go a long way in curbing such crimes which are growing in the society,” said Mahanta while lauding the special investigating team for cracking the case with a short spell.